The teenagers from Stoneman Douglas High are teaching us a lesson in calling BS. Politicians—and, frankly, advocacy groups—can get hung up on the wonky details of the gun debate. Rather than haggling over the definition of “assault weapon” or what the framers of the constitution meant by “well regulated,” how about we speak in blunter terms? What is the acceptable number of shootings per year? What is an appropriate number of school children murdered by guns per year? How many gun-deaths by suicide does our society consider healthy? As a nation, we’ve made progress on another epidemic by addressing it in similar terms: Auto fatalities. 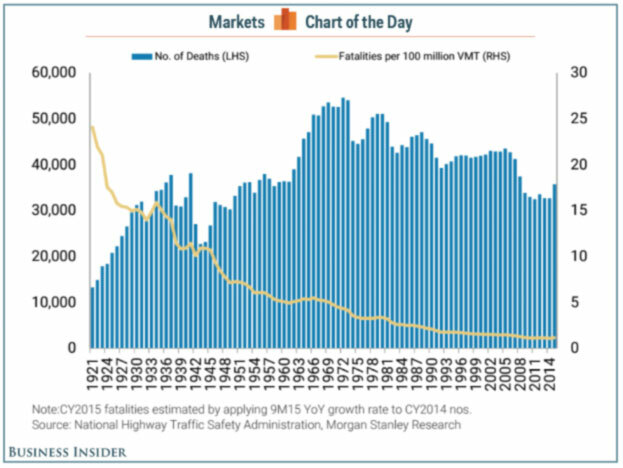 With improved safety standards and education, fatalities per vehicle-miles-traveled have steadily declined. Since 2013, there have been nearly 300 school shootings in America — an average of about one a week. Let’s follow the lead of the Stoneman Douglas survivors and call BS on any “argument” that deflects from what’s really going on. We seem to have finally reached a tipping point in the gun debate. But only Congress and state lawmakers can bring about real change. And it’s up to us to apply pressure on them until laws are passed and lives are saved. We can do that, by calling BS.